July 2011 "Comox Valley Walk of Achievement." After the induction ceremony in the Sid Williams Theatre, friends, relatives, city officials, and an RCMP honour guard walked up the main street of Courtenay to "unveil" the plaque in the sidewalk in front of The Laughing Oyster Book Store. 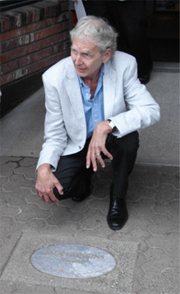 2009-2010 Member of the Order of Canada - "For his contributions to Canadian literature as a writer whose work celebrates the people and landscape of Vancouver Island, and for his leadership as a teacher and mentor to many." In Jack Hodgins' fiction, the people and places of Vancouver Island come alive, often in the midst of mysterious and magical forces. He is an acclaimed writer, admired for his structural and linguistic adventurousness. His work, known throughout the world, has garnered numberous honours, including the Governor General Literary Award for ficiton and the Commonwealth Literature Prize. He has also had tremendous influence as a teacher and mentor, and has shared his expertise in A Passion for Narrative, a highly regarded guide to writing fiction." 2006 "Lieutenant Governor's Award for Literary Excellence"
2006 Terasen Lifetime Achievement Award "for an outstanding literary career in British Columbia"
1999 Broken Ground: in Globe and Mail "top ten"
1996 "Finding Merville": (Comox Valley Record) first place in Neville Shanks Memorial Award for Historical Writing.